Cotton handkerchief gift set of 2 with pretty floral spray embroidery and initials or short name of your choice personalised. Soft lightweight cotton handkerchiefs featuring a beautiful flower motif to one corner. 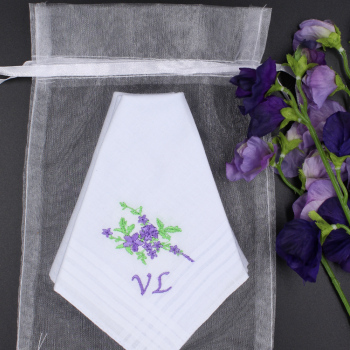 We personalise the pair of handkerchiefs with initials or a short name of your choice of thread colour and font style.